As recently as five years ago, we knew never to give out our personal information on the Internet. Since childhood, we’ve known never to get in a stranger’s car. In 2017, we put our personal information on the internet specifically to summon a stranger to our house, so we can ride in their car. Digital transformation is changing the ways we shop, travel, and do business. And the road to the future is littered with stalled vehicles, whole industries that failed to adapt. From video stores to photography companies to print publications, only a few managed to evolve and thrive. The always-on, always-connected world is changing customer support, too, and at an alarming rate. Just when we fully got a handle on live chat, chatbots started to change the game. As soon as we master one social media platform, three new ones start gaining traction. The upside, though, is that businesses can have a closer relationship with customers than ever before. We have the data to understand their journey in granular detail, and the tools to meet them at every stage of that journey. We can be proactive, not reactive. We can personalize support to provide the type of experience that encourages loyalty and advocacy. The holy grail of customer support — personalized service at scale — is within our reach. 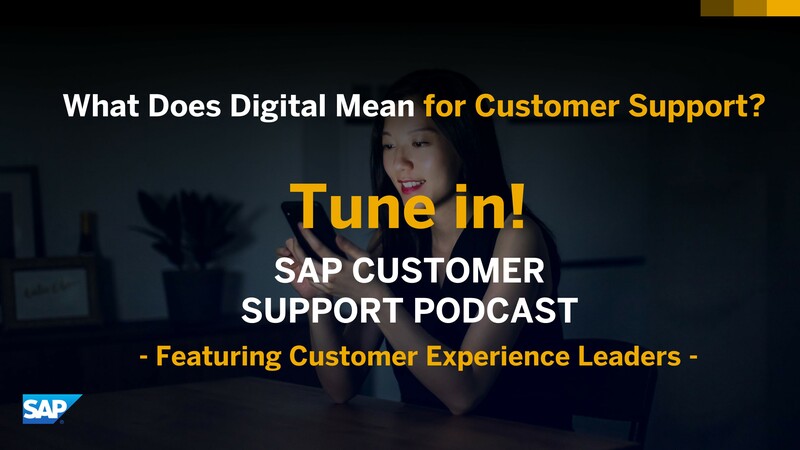 On this episode of the SAP Customer Support Podcast, we asked our panel of experts how digital transformation is changing support, and how your business can leverage these changes to get closer to your customers. Elaina Stergiades, Research Manager at IDC, explains the four key drivers of change in customer support. Mohammed M. Ajouz, Senior Vice President, Global Head of Product Support at SAP, shares how you can use technology to prevent value erosion. Tim Crawford, CIO Strategic Advisor at AVOA, explores the ways machine learning can enable proactive support. Download the episode now for these insights and more from 14 experts in the customer support industry. Digital transformation has disrupted every industry, from taxis to travel to television. It’s up to us to use this transformation to make customer support more proactive, personalized, and valuable for the customers we serve. On the next episode of the SAP Customer Support Podcast, our panel will explore how you can “future-proof” your customer support. Subscribe now to make sure you never miss an episode. Why is this only available via iTunes? Any possibility of providing a non iTunes download? Thanks for your feedback! We are currently working on providing an additional opportunity to download this. Will keep you posted here.